It's finally here, The highly addictive game Temple Run is now available as a free download in the Google Play and it should be compatible in all devices running Android 2.1 OS and higher. If you may recall, Imangi Studios told that the game version for android will be released last February 2012, but moves instead on March 27. That's why you can now download temple run for android free. Temple Run will simply challeged players reflex as they run, jump, slide and avoid various obstacles, collect those coins and don't forget to buy those power ups. It first comes in iOS device such as on iPhone and iPad and now it is basically the same thing with Android platforms. You can now use your Android device to swipe and dodge with your character and start collecting those cursed idol then start running with your life. So be focus on jumping and dodging on those obstacles and start and tilt your phone to be able to escape the evil monkey. To start playing this highly acclaimed Temple Run, simply download temple run for android free on Google Play Shop. It's a very reason for a person buy a house is to have somewhere to live in. It's one of the biggest and smartest decisions made by a couple. Every house is more than just an investment because it is here where youbuild a family and dreams. 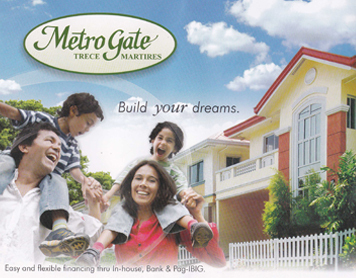 Garnet Group,SSN, Moldex Realty Marketing Inc.
**images and details posted above from this site is credit to respective owners and from brochure,flyer provided by the contact person above and the Metro Gate Trece Martires website. This site is also not related with Metro Gate Trece Martires website. Details and images may change without prior notice. Finally! Instagram is finally available in Android App, This one of the most popular app from apple store since its debut last October 2012, it's a popular app photo sharing on the social networking services. which even reached more than 27 Million registered user from Apple app store. Lots of iPhone, IPad, and even iPod Touch users are highly hooked with this cool apps, but now it's in Android Phones and Android Tablets turn to explore in this Instagram. Instagram allows you to take a photo, apply a digital effect filter, then share it on a array of social networking services in a easy steps. It was March 11, 2012 when co-founder of Instagram Kevin Systrom stated the Instagram is coming to Android very soon and he added that instagram for android is in some ways better than the current version in iOS, and even works faster and better on the larger screens. For Androd user, just a wait little bit more, because Instagram is currently on beta testing and nearing to its launched in apps world. You can download Instagram for android free, just visit android market also known as Google Play, once the app is ready for download. The No.1 Campus Magazine in the Philippines, Chalk Magazine launched its summer issue with the cover one of most beautiful faces in her generation, Ms. Erich Gonzales. She is also starring in Skylight Films Horror-drama Corazon: ang Unang Aswang together with Derek Ramsay and Directed by Richard Somes. 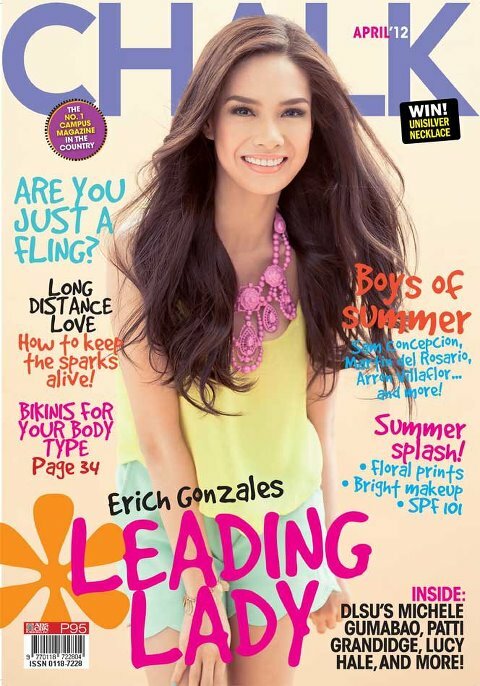 Chalk Magazine also includes issues inside with Michelle Gumabao, Sam Concepcion, Lucy Hale, Aaron Villaflor and more. It's already out in the market so grab a copy. It was Victor Buan Valdez from Technological University of the Philippines-Manila (TUP) tops all other exam takers with 92.85% rate and followed by Marc Philippe Tiu Ladaga for Mapua Institute of Technology-Manila in 2nd place in recent Mechanical Engineer Licensure Exam 2012. The Professional Regulation Commission (PRC) announced there 650 out of 1,089 passed the Mechanical Engineer Licensure Examination. There are also 23 who passed the Technical Evaluation for the Upgrading as Professional Mechanical Engineer given by the Board of Mechanical Engineering in Manila and Cebu for the this March 2012. (cedula), 2 pieces passport size picture (colored with white background and complete nametag), 1 piece 1” x 1” picture (colored with white background and complete nametag), 2 sets of metered documentary stamps and 1 short brown envelope with name and profession and to pay the Initial Registration Fee of P600 and Annual Registration Fee of P450 for 2012-2015 for MECHANICAL ENGINEER; Initial Registration Fee of P450 and Annual Registration Fee of P420 for 2012-2015 for CERTIFIED PLANT MECHANIC. Successful examiners should personally register and sign in the Roster of Registered Professionals. The delayed reaction flop video of Mick Pennisi is now the viral and and become latest sensation in some social networks and sport news, it was held last PBA Game, March 21, 2012 at SMART Araneta Center, when Petron's Blaze import Will Mc Donalds lose his temper and intentionally throw the ball at the head of Barako's Mick Pennisi, who waited and couple of seconds before he reacted. After uploading it in Youtube, the video has become trending and sensation online. takes the cake.” Because of this epic video Pennisi is now dealing with his new sensation and acclaimed the "The Flop". Looking for the best summer place for adventure? or just looking for some place for relaxation from stressful life in the city. Check out Pinoy Trend as it includes DJ Paradise Resort as One of the Best Summer Getaways Resorts in the Philippines. This will feature DJ Paradise Resort's rates, reviews, latest updates, cottages, reservations, exciting pools contacts and location map. 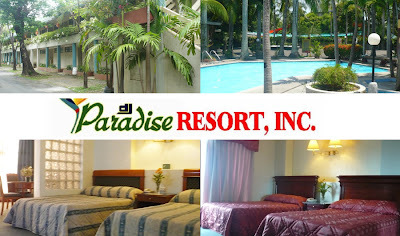 DJ Paradise Resort is nestled in Mc Arthur Hi-way, Dakila, City of Malolos, Bulacan and just 45 minutes from Manila. recreational facilites. You can also enjoy their made from Bamboo Picnic Sheds like the canopy, single and double shed, the nipa hut, bamboo hut, floating cottage and the ring park. so come unwind and experience the Bulacan's total resort, the DJ Paradise Resort. **images and details from this site credit to respective owners and from DJ Paradise Resort Multiply account: http://djparadiseresort.multiply.com and FB account: http://www.facebook.com/djparadiseresort. The main objective of this site is to feature DJ Paradise Resort for the one of the Summer Getaway Resort Philippines with their rates, reviews, latest updates, cottages, reservations, exciting pools, contacts and location map. This site is also not related with DJ Paradise Resort. Wondering what's the best thing about the summer? It's the best season for swimming with your family and friends. This also tell us to feature another excellent summer resort for you to visit here in Philippines, The Amana Waterpark Resort. Amana Waterpart Resort is being boast for having the biggest wave pool in the country. 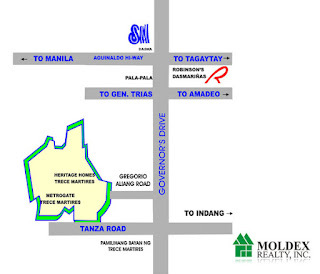 It's hour drive away from Quezon City located at Santisima St. Bagong Barrio, Pandi, Bulacan. Amana Waterpark Resort offers 13 different kinds of waves and different life size statues of your favorite cartoon and movie film characters can be seen all over the place that children will surely enjoy taking picture with those statues. Amana Waterpark Resort, is also adjudged by Google as the 2nd Fastest-rising summer destination of the Philippines, which also offers 3,500 sq meter wave-pool that produces the biggest wave (Diamond wave). That's not all, Amana Resort in Bulacan also offers horseback riding, souvenir shop, breezy cottages made of local materials, Spa/massage, picnic grove, videoke, and fishing and billiards. You can also check their beautiful cottages inspired with famous place in the philippines: Boracay, Tagaytay, Baler, Laoag, Camiguin, Palawan, Calatagan, Vigan and Batanes Room. Just a little bit more waiting as Amana Waterpark added new fun and more excitement coming this summer as they presents their own version of Zipline which will be opened soon. 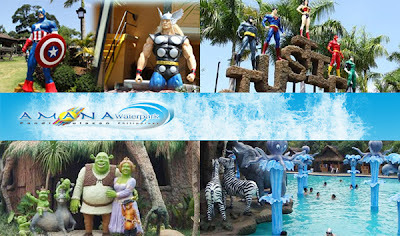 **images and details from this site credit to respective owners and from Amana Waterpark Resort website: http://www.amanawaterpark.ph. The main objective of this site is to feature Amana Waterpark Resort for the one of the Summer Getaway Resort Philippines with their rates, reviews, latest updates, cottages, reservations, exciting pools, contacts and location map. This site is also not related with Amana Waterpark Resort. Stress with a whole year work and looking fo a perfect get-away place this summer? Good to drop by as we feature a perfect place for you and your family to relax and relieve your minds from stressful work and city. Bosay Resort, total of 8 pools for guess to choose from, adult pools and kiddie pools available for public use and there are also private pools for those guess who like to have their a privacy moment. 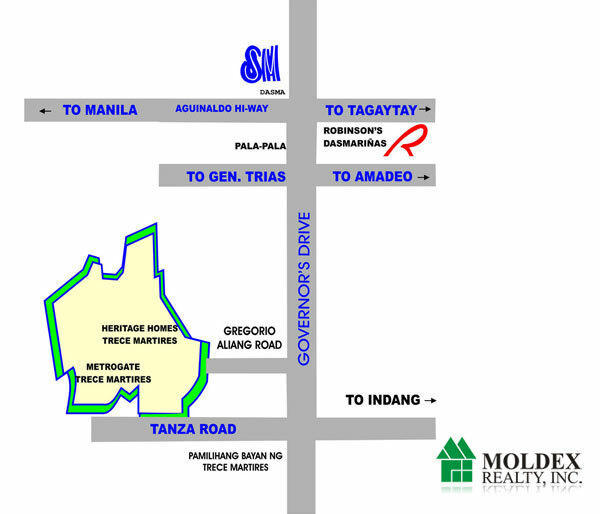 Bosay Resort is located at Marigman Rd. Brgy. San Roque it is near Galang Compound, Antipolo City, Antipolo, Philippines. You can also rent of their affordable and very elegant Cottages, Pavillion, Excutive Rooms, Private Pools with Jacuzzi and the Clubhouse. You can check out the Olympic Pool which is designed for professional training venue of Bosay Aquatic Club Members and the Disco Pool considered the first contemporary pool amusement in the country. There are various routes lead to Bosay Resort. The fastest way is to ride LRT 2 then alight at Santolan Station, ride jeep going to overlooking route from Masinag all the way through Antipolo Church. *prices may change without prior notice. Images and details from this blog credit from Bosay Resort website. Pinoy Trend is also no related to any Bosay Resort, this to feature Bosay Resort for the one of the Summer Getaway Resort Philippines with their rates, latest updates, wooden cottages, reservations, exciting pools and their contacts. Jessica Sanchez moves another step closer to the top in American Idol Season 11, as she safe from elimination during American Idol’s Top 13 result showcasing their talent to about 40 million people on Thursday night (Friday morning in Manila). No doubt she got the most votes as she stunned and wowed the audience and even received another standing ovation from the judges for her heartfelt rendition of Whitney Houston’s classic “I Will Always Love You”. Here are the list of names who moves in the safe zone: Jessica Sanchez, Hollie Cavanagh, Skyler Laine, Colton Dixon, Heejun Han, Phillip Phillips, DeAndre Brackensick. While Elise Testone, Erika Van Pelt, Shannon Magrane, Jermaine Jones, Joshua Ledet, and Jeremy Rosado is at the bottom six. Jeremy Rosado and Elise Testone placed right at the bottom spots leaving Jeremy Rosado as the one going home last tonight. Congratulations to Jessica! Proud to be a Filipino! The stage is set for welterweight boxing championship, The Manny Pacquiao vs Timothy Bradley Fight. It's already official the fight between Philippine Pride Manny Pacquiao and undefeated junior welteweight Timothy Bradley which will be held on June 9 2012 at MGM Grand Garden Arena in Las Vegas, Nevada (June 10, 2012, Philippine Time). The Pacquiao vs Timothy bout will guarantee somehow more that $5 million for Bradley and $25 million for Pacquiao for this fight. Timothy Bradley(28-0, 12 KOs), current WBO Junior Welterweight Champion also known as “The Desert Storm” is undefeated through 28 professional fights and has been dominant in victories over Kendall Holt and Lamont Peterson earlier in his career. Bradley also defeated veteran boxer Joel Casamayor via an eighth-round TKO in the undercard of the Pacquiao-Marquez trilogy bout. Manny "Pacman" Pacquiao (54-3-2, 38 KOs), currently 8-division title holder and Philippines Pride, might considering retiring from boxing next year after this fight Timothy Bradley. Pacquiao considered the Church’s offer to become a Bible ambassador and may focus on his political plans. so the the bad news is, The bad news is, as predicted, Mayweather Pacquiao isn’t happening. The fight bout will be broadcast Live on Pay-per-View. You should bookmark this page as we give you latest news and updates even Online Live Streaming on Pacquiao vs Bradley Fight (June 10, 2012, Philippine Time). The Pacquiao vs Bradley Fight tickets will be priced at $1,200, $900, $600, $400, and $200. Ticket sales at $1,200, $900, $600 and $400 are limited to 10 per person and ticket sales at $200 are limited to two (2) per person. It will go on sale Next Friday 24 at 1 p.m. ET / 10 a.m.PT. The one of youtube sensation Julie Anne San Jose sings duet with GMA's new talent Derrick Monasterio for the theme song of the upcoming romantic comedy “My Kontrabida Girl", from GMA Films. The upcoming movie "My Kontrabida Girl" by GMA Films starring Rhian Ramos as Isabel and Aljur Abrenica as Chris will be released and expected to be on Philippine cinemas on March 14, 2012 and directed by Jade Castro. Check out the music video for the romantic movie "My Kontrabida Girl" featuring the song "Ang Aking Puso" as interpreted by Julie Anne San Jose and Derrick Monasterio and the song is composed by Janno Gibbs. Good news for all mobile users, Check out another first from Sun Postpaid which you surely enjoy calling, texting and mobile surfing with paying less on your monthly bill. 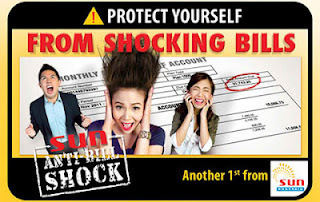 Sun's promo Anti-Bill Shock for data plans last October 2011 is succesful one, then followed by Smart and Globe later in January 2012. This time the Sun Cellular finally rounded up more plans to include SMS and voice plans. This new one is for their SMS plans which offers 1,000 free text messages to other networks for only PhP 199 per month. Additional SMS beyond the 1,000 allocation is charged PhP1. However, once you reach 1350 SMS or more. Sun Cellular will only charge you a flat rate of only PhP549. Just text “ABS199 ON” to 2199 or call *199#. The other one is for their Mobile Landline plan which includes Sun Cellular Mobile postpaid service and a SunTel Wireless Landlin service.